Adult learners have unique challenges, but also bring important strengths to the classroom. 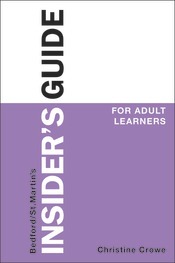 Insider’s Guide for Adult Learners is a practical guide to facing those challenges and making the most of those strengths. It includes key coverage of important topics such as financial and academic planning, time management, and maintaining motivation for your successful transition back to the classroom. Short, smart, and student-friendly, these guides reveal all the insider secrets to a successful college experience. Covering topics such as academic planning, beating test anxiety, responsible credit card use, and many more, they make perfect supplements to your textbook and course work.